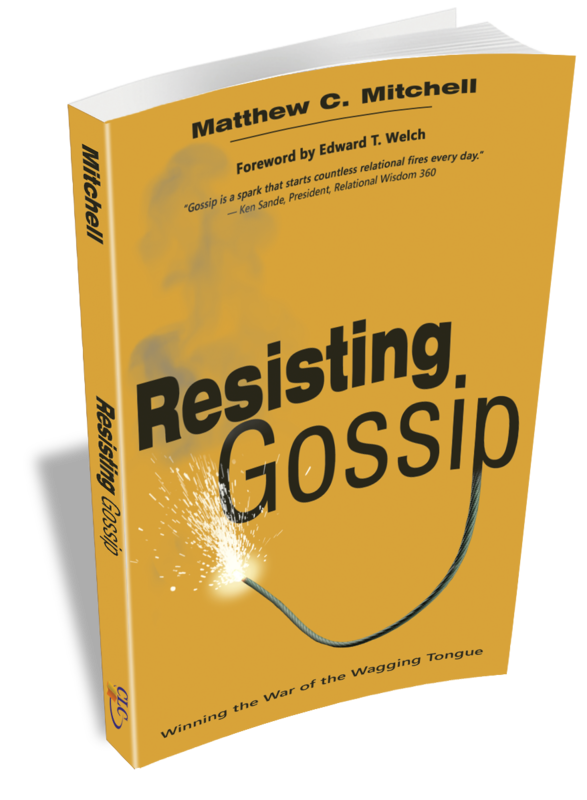 One of my worries when I was writing Resisting Gossip was that some unscrupulous church leaders would misuse it to silence dissent among their followers. I could foresee insecure and/or controlling pastors piously holding the book up to their people and subtly saying, "See! You shouldn't criticize or disagree with me. I'll decide what gets talked about around here and when. We're going to be a gossip-free church." Pastors and other church leaders are often the target of a whispering campaign. But not all dissent is unloving or unhealthily pursued. In churches where the leaders seem to be hiding key things or putting a "spin" on all of the information that gets disseminated, it's often difficult for the rest of the church to discern what is going on. Followers should ask their questions openly with respect, care, and love, trusting their leaders as much as they possibly can, but leaders should also bend over backwards to extend grace to those who disagree with them or are concerned about questionable decisions and internal conflicts. If both groups are careful and loving, then the heaviest situations can be successfully navigated. But just because one side is handling things poorly doesn't give the other side a reason to take the lower road. The flip side to the last two points is that leaders must create and sustain open channels of communication in the church for those who have concerns. Sometimes when there is gossip within a church, it is actually the leaders’ fault. Those who are gossiping should not be doing it, but gossip flourishes when there is an oppressive regime and a tyrannical atmosphere of silence. When was the last time you asked for constructive feedback? Paul told Timothy, “The Lord’s servant must not quarrel; instead, he must be kind to everyone, able to teach, not resentful” (2 Tim. 2:24). That does not mean that a good church leader will agree with all the criticisms he receives or will budge on orthodoxy, but he will humble himself to solicit critique. Being approachable is easier said than done. I know I have failed to listen more than I have succeeded, but I often quote Proverbs 27:6 to my people: “Wounds from a friend can be trusted, but an enemy multiplies kisses.” Hurt me, friend, if I need it. That is love. (Resisting Gossip, pg. 168). I have no way of telling if my worries have come true and if unhealthy pastors are using my book to shield themselves from accountability. I hope not, but I'm not naive enough to believe it will never happen. I certainly didn't write it to insulate bad leaders. I wrote it to combat the real sin of gossip which can tear a church from limb to limb. I wrote it in the way I did hoping that unhealthy church leaders would not have another tool in their toolbox for mis-shepherding the flock under their care. May the Chief Shepherd protect His people from both errors and dangers (1 Peter 5:1-4).